You know the saying "When in Rome...do as the Romans do."? 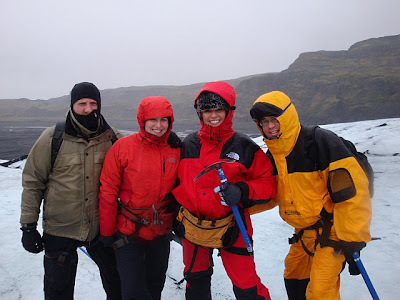 Well, the same goes for Iceland, when in Iceland...do a glacier hike! 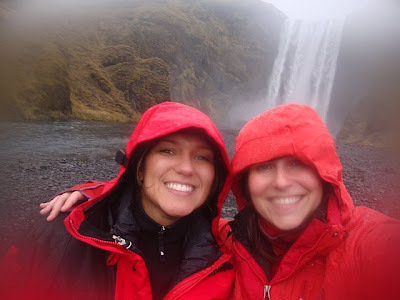 My friend Laura is definitely the adventurous type and suggested that we go on a glacier hike in Iceland. I agreed, thinking how hard could it be, right? She told me it would be a 2 out of a 5...boy, was I in for a shock! In the end, I'm glad we did it, but only because I made it down unscathed!. Our day started at 9:30am. 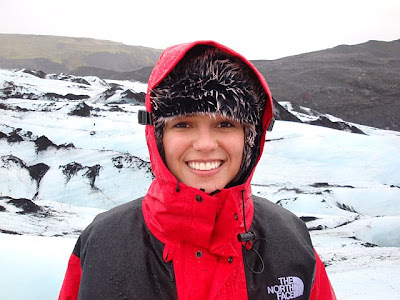 We signed up to go with a tour group called Arctic Adventures. Our driver and guides name was Mio. There were six of us in total on the hike (including Mio). 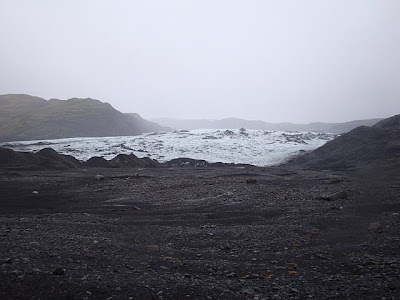 It took about 2 and 1/2 hours to drive out to a glacier known as Skogar on the south coast of Iceland. The drive was absolutely beautiful, with views of mountains and the Atlantic Ocean along the way. 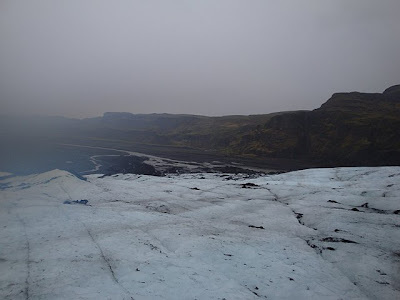 When we got to Skogar, it was raining and windy...great weather for a glacier hike...not! 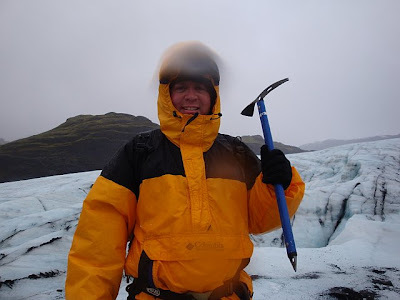 Mio fitted us each for our crampons, gave us an ice pick- which also could be used as a walking stick, and he taught us how to walk both up and down the glacier. Five minutes later, we were on our way to the top! 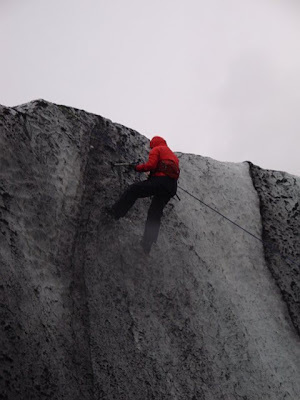 Along the way, we would walk very close to something known as crevasses- holes about 20-30 feet deep. It was scary! You definitely had to watch where you were going at all times. The sight from the top was spectacular. 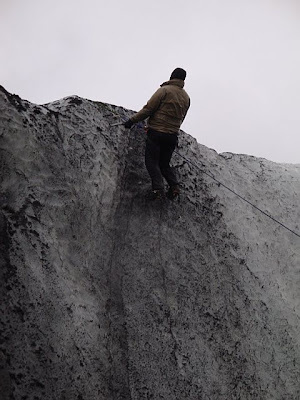 Laura and her boyfriend, Pierre, even ice climbed. They sure are brave! It was a great experience- and quite a good workout too I might add. It was definitely out of my comfort zone, and Rich felt the same way, but we are so glad we did it! 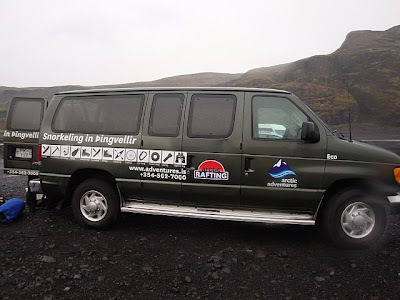 After the three hour hike, we drove to see Skogafoss waterfall. 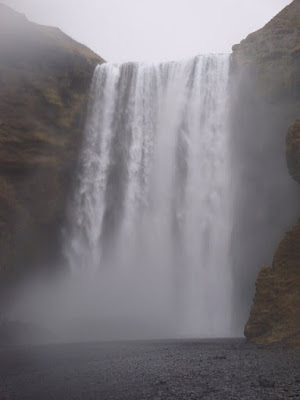 It's not as big as Gulfoss, but it beautifully topples down a rocky cliff. 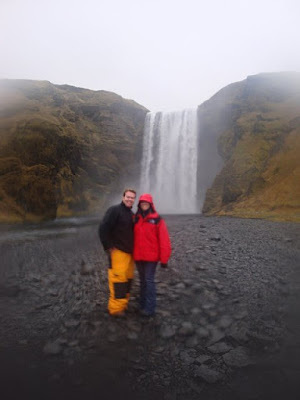 After this day...we certainly needed another visit to one of Reykjavik's geothermal pools...and that's exactly what we did. For dinner that night, we wanted something not so fancy, and headed to American Style for hamburgers. 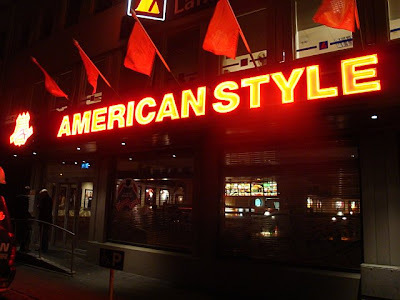 Icelanders love their fast food...and American Style is where locals like to go. This place looks like a fast food joint when you first walk in and it acts like one too. You have to go up to the register to place your order and pay, and then you sit down and they bring the food out to you. 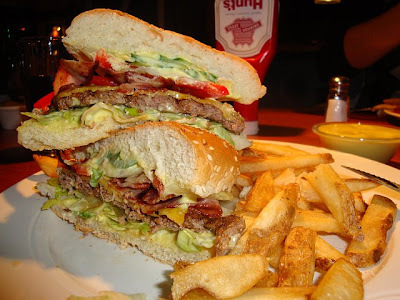 We had bacon burgers- which come with special sauce on them- and french fries. 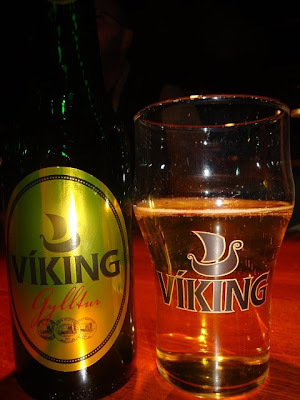 We washed it all down with a local Viking beer. 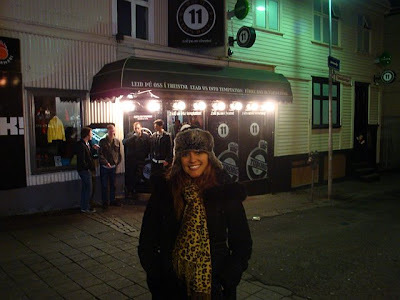 Since it was a Friday night, we decided to do the Runtur- Reykjavik's pub crawl. the Runtur happens every Friday and Saturday night along Laugavegar- the main street in town. 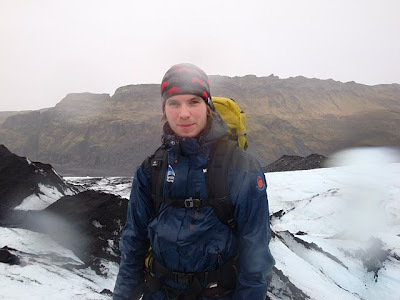 Icelanders dress up and head out to the bars to drink, dance and be merry. The good times last until about 6 in the morning when places finally close. 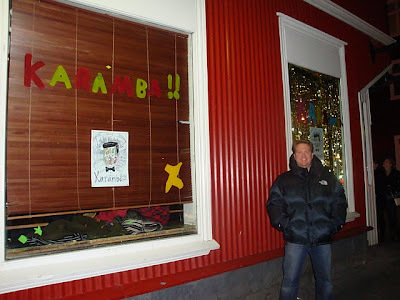 We started our Runtur at Karamba- which is a coffee house by day and a lounge/bar at night. 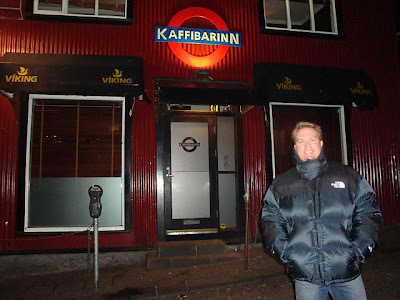 From there we went to Kaffibarrin- which has the London Underground symbol over the door. Inside, it's really cute and looks like an old house. Next we went to Bar 11 which is your standard bar. 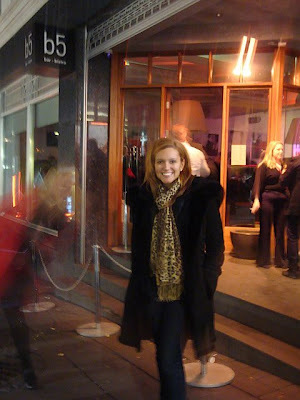 The last place on our Runtur was B5- a super sleek spot that has great music and is a good place to dance. 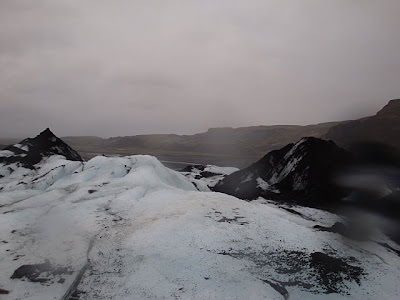 Next week, you can read about some of Reykjavik's great shopping and the Blue Lagoon...stay tuned! If there was anything you think we could have done better during your trip please let me know. We are always improving our services and want to do everything we can to make our trips as good as we possibly can for our customers. Best regards / Bestu kveðjur!